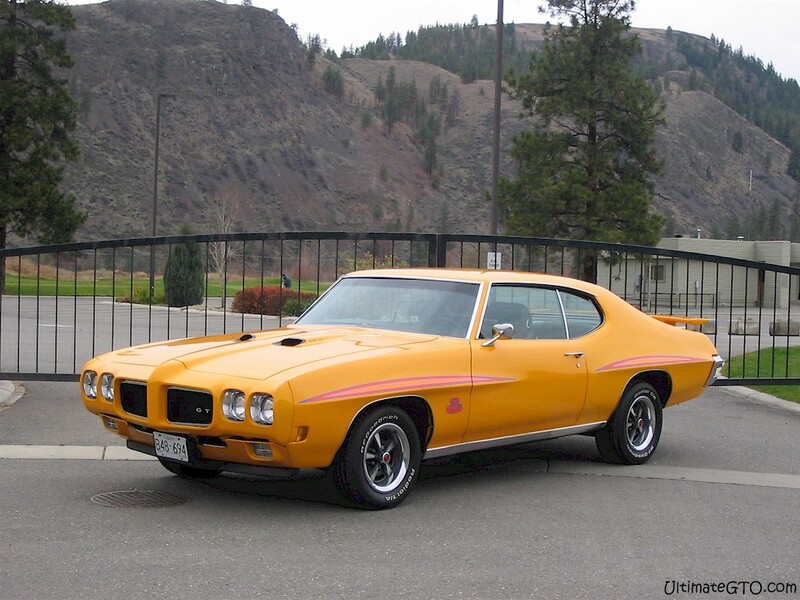 1970 Pontiac GTOs. Lot 23 of 95. CLICK-> Orbit Orange 1970 Judge hardtop, engine view without the air filter. CLICK-> Orbit Orange 1970 Judge hardtop, engine view without the air filter from the other side. CLICK-> Orbit Orange 1970 Judge hardtop, left front view. You can get this shot in two desktop wallpaper sizes; 800-600 wallpaper and 1024-768 wallpaper. CLICK-> Orbit Orange 1970 Judge hardtop, left side view. The stripes are reflecting a bright yellow in this shot. CLICK-> A close-up of "The Judge" decal on Pete's Orbit Orange 1970 Judge hardtop. CLICK-> Check out Pete's Orbit Orange 1970 Judge in front of a huge tiger mural. He spotted it on the way to the Kelowna Feel the heat Pontiac car show. It is in a small town on Hwy 97 called Westwold. CLICK-> Pete's Judge at a car show. The black car next to him is his "buddies 01 WS6 Trans Am. His back and his girl sitting behind my Judge guarding her." CLICK-> Cardinal Red 1970 GTO hardtop owned by Elmer Falcon from North Brunswick, New Jersey. Take a closer look, it's worth it. Here's what Elmer had to say, "My father purchased the car new and from that day on, I asked him to make sure I got the car when I started driving. He gave it to me in 1983 after logging about 100,000 miles on it. My father passed away in 1985 and it was at that point that I decided to save some money and restore the car. I took it off the road early in 1988 and teamed up with a friend who did the body work and I did the mechanical. The car was completed in the summer of 1989 and has been garage kept ever since. I usually put about 2-300 miles a year on it. Everything was replaced except the roof and trunk lid. The only addition items added that were not ordered on it when new was the wing, hood tach and Judge stripes." CLICK-> Cardinal Red 1970 GTO hardtop, left side view. CLICK-> Here is an updated picture of Elmer's Cardinal Red 1970 GTO hardtop. Notice any changes? Elmer explains, "It seemed that a lot of 70 GTOs I saw had the Judge stripes so I decided to go back to the stock look. Same thing goes for the wing so I'm looking for a plain trunk to put on the car and keep the wing/trunk intact in case I change my mind." CLICK-> Elmer sends us some updated shots of his Cardinal Red 1970 GTO hardtop. CLICK-> Cardinal Red 1970 GTO hardtop, left rear view. CLICK-> Diagonal shot of Elmer's Cardinal Red 1970 GTO hardtop. Nice! CLICK-> Take a look at this orange 1970 GTO hardtop that Steve Richardson just bought (summer 2002). It's his first GTO. CLICK-> Here's a shot of the interior in Steve's new GTO. Looks like a Oldsmobile steering wheel. There's also a set of little gauges installed right into the dash above the vent controls.